Click: Western Diesel Services, Inc.
Hugh Scott, Sr. and G.A. Weidlich founded Western Machinery Company in St. Louis in 1929. The company began as a multi-line distributor of power transmission equipment, principally chain drives, V-belt drives and hydraulic motors. Detroit Diesel engine line became the focus of business. Construction and GMC truck franchises were eliminated and government contracting and mining equipment divisions were sold to strengthen the Detroit Diesel operation. CK Power was created as a segment of Costello Kunze (CK) Ford in Florissant, MO. Under the direction of Tom E. Costello CK Power was the exclusive engine distributor for Ford, John Deere, Kubota and Kohler Generators. 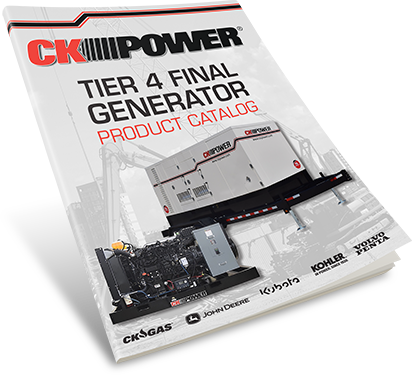 CK Power focused on a core business of engine and generator distribution. Western Diesel Services acquired all stock in CK Power. From 1985-1991, CK Power operated as a wholly owned subsidiary of Western Diesel Services, Inc.
John Costello became President and Chief Operating Officer of CK Power. During this time John established CK Power as an industry leader in engine distribution and power generation solutions. John Costello acquired Western Diesel Services Inc., DBA CK Power from partner Hugh Scott Jr. John became Owner and Chief Executive Officer of CK Power. Under the direction of John Costello, Owner and CEO, Paul Ostby, President and Jim Flynn, CFO, Western Diesel Services DBA CK Power is an industry leader in its core business of engine distribution and providing power solutions. CK Power is a leading manufacturer of power units and power generation solutions for a variety of markets and customers. CK Power is also a proud distributor and authorized service provider of Kohler Power Systems. Our mission is to continually expand and improve our power solutions product offering.